It’s finished! Hip hip hooray! This quilt top spent far too many months sitting, but now is complete. I stitched the borders on a couple of weeks ago and talked my husband and son into holding it up for a quick photo. It’s huge! 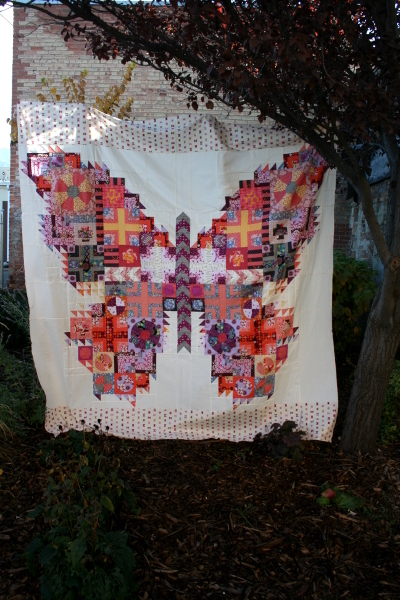 I’ll share more photos of this quilt after it’s quilted – there is no way I’m doing this one myself. The color scheme is very similar to Tula Pink’s original, but I used fabrics from many different designers to make it my own. I really love how it looks and will be sure to share when it’s done! I’m not doing too great on my 14 quilts in 2014 goal, but if you count quilt tops I’m close. 🙂 It always feels good to get a project to this point, especially a project like this. Yay! Wow! It is beautiful. Love the colors you used. I LOVE tHIS!!!! So beautiful. How long did it take?